smashface - Epic Fu Nominated for a Second Webby Award! 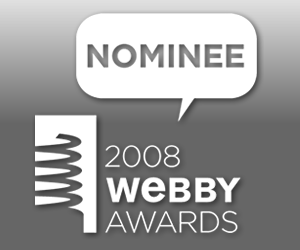 Epic Fu Nominated for a Second Webby Award! We're really proud to be able to say that EPIC-FU is nominated for a 2008 Webby Award in the Variety category of Film & Video! It's really exciting because we won the People's Voice Webby Award in 2007 for JETSET, which would eventually evolve into EPIC-FU. Zadi, Rick, and I have all worked very hard to make a show that strives to be consistently creative and entertaining, as well as a resource of information and a tastemaker for our audience. We have some very tough competition this year, including our friend Alex Albrecht's show The Totally Rad Show, along with Tom Green, The NY Times, and our friends at Good Magazine. If you watch the show and you like EPIC-FU, please take a couple of minutes to vote for us for the People's Voice award. If you're registered and logged in, you can click this link to go directly to the form. Otherwise you can find us by going to pv.webbyawards.com and going to Film & Video and voting in the Variety category. Thanks! And a special thanks to Rick Rey, our erstwhile associate producer who gets very little of the credit for his work on the show, but has a lot to do with its content and creativity. Rock on, Rick!